Planter boxes that are built to last. Season after season. Build a container garden that lasts with durable cedar planters. Want to grow strawberries on your patio? How about cucumbers on your deck, or tomatoes on your balcony? 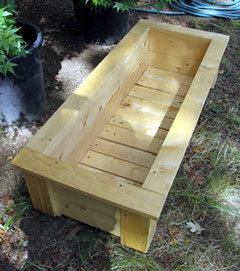 With our flexible system of cedar planter kits, you can build a container garden to fit any situation. And it will last for years. Season after season. These are not your typical wood planters that fall apart after a few years of exposure. Our garden planters are built to last, using strong construction and durable cedar—over two inches thick at the corners. The rot-resistant cedar is made even more durable by a non-toxic waterproof sealant that is safe for vegetable gardening. Really. No toxins or VOCs. Planter boxes can be set up anywhere for a quick and convenient container garden. The planter's slatted cedar bottom sits an inch off the ground and provides excellent drainage on non-absorbant surfaces such as compacted dirt and concrete. Planter boxes can be paired with a variety of matching garden trellises for attractive and productive vertical gardening. Available for any size planter. Planter boxes are available in hundreds of shapes and sizes, to grow everything from shallow rooted herbs and flowers to deep rooted vegetables, perennial shrubs and small trees. Square and rectangle planters are practical and versatile, used alone or in combination with L-shaped planters to enclose a deck or patio. Hexagon and octagon planters, in regular and elongated varieties, make eye-catching centerpieces and corner accents. Standing planters raise your garden to a comfortable working height, for an easy and accessible container garden. Mix and match planter shapes for unique garden designs. Choose a shape below to get started!